November 15, 2018 – Coins, medals, decorations. All of them are everlasting. Every time a 2000 year old treasure is unearthed during construction work, we are reminded of this fact. Minted metal preserves the history of an era, a nation, a ruling family, or an individual person, for an eternity. And that is precisely the idea behind the tradition of the so-called “Challenge Coins” of the Bundeswehr. 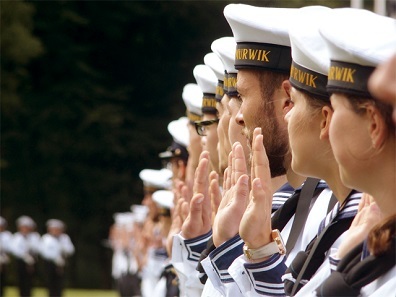 The German armed forces and associated authorities consist of the German Army, the German Navy, the German Air Force, the Joint Support Service (SKB), the Medical Corps, and, as of late, the Cyber and Information Space Command. In all these branches, Challenge Coins have become popular. They are struck to eternalize special achievements, extraordinary accomplishments, and an overall sense of camaraderie. They are neither campaign medals nor decorations distributed by official institutions. Rather, it’s the soldiers themselves who decide when and why these Coins are produced. Solidarity and camaraderie are essential in basic training and deployment alike. Photo: Bundeswehr / Bähr. How did they come up with the idea? A few months ago, in the context of the to and fro of whether Donald Trump and Kim Jong-un were eventually going to meet, we reported on how the tradition of Challenge Coins developed in the United States. Numismatic experts will no doubt harrumph at this point and point out that Challenge Coins are not actually coins. They’re right, of course. These “Coins” are neither an official means of payment nor do they depict a face value. Undoubtedly, Challenge Coins are medals. But the term “Coins” has irrevocably taken root among U.S.-American service members. Over the course of the 20th century, these Coins became increasingly important among troops. By the 1990s, these Coins began making their way into other institutions – e.g. the White House. U.S.-American presidents now distribute them to all those who participate in diplomatic tours. Civilians can purchase the same pieces at the White House gift shop. 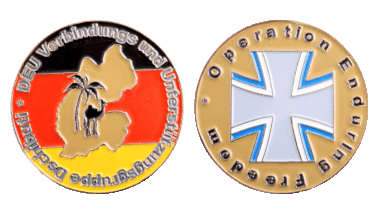 While Bundeswehr Challenge Coins are occasionally also given to delegates from other countries, the original idea behind these coins remains truer to the original. 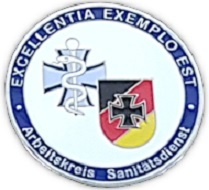 Challenge Coins are distributed within all Bundeswehr branches. Photo: Bundeswehr / Lindner. There is no doubt that German soldiers adopted the tradition from their U.S.-American counterparts. However, we can’t say for sure when it happened. 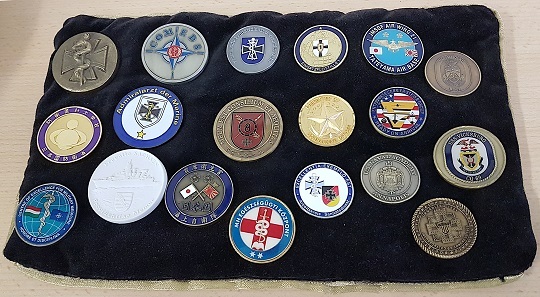 According to a spokesman of the German Ministry of Defense, the first of these Coins were probably commissioned and distributed in the context of the Bundeswehr campaigns in Croatia (IFOR) and Kosovo (KFOR). 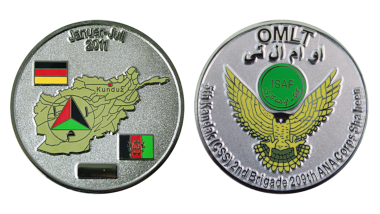 Campaign medals awarded for the service during the KFOR and Operation Enduring Freedom campaigns. Photo: Airbornelawyer / CC BY-SA 3.0. There are two factors that are likely to have influenced the development of this tradition. 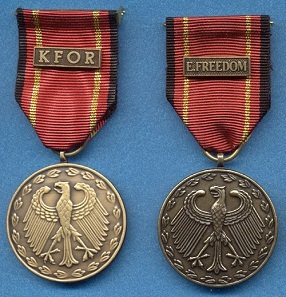 On the one hand, German campaign medals were awarded by the German Minister of Defense for the first time in 1996. So why shouldn’t soldiers have unofficial medals minted for themselves as well? On the other hand, German troops participating in these campaigns were in close contact with American soldiers. They are likely to have been present during “Coin Checks” and some might have even received pieces as a gift. What do the Coins look like and where are they produced? The company commander, the training course director, the battalion officer etc. – they’re the ones who commission the minting of Challenge Coins either on their own initiative or at the suggestions of the entire unit. This gives us an idea of the mintage we are talking about here: only a few dozens of these Coins are struck. 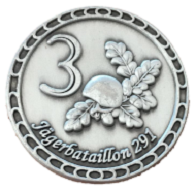 A Challenge Coin of the 2nd company of the Jägerbatallion 291. The obverse shows the outline of a crest as well the Bundeswehr insignia in the background, the number 2, an oak leaf (the beret flashes of Jäger troops), the year of issue (censored), and a crown. A serial number (censored) was added underneath. 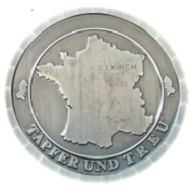 The reverse features the outline of France and the battalion’s deployment location in Illkirch-Graffenstaden, oak leaves, and their unofficial motto “Tapfer und Treu” (engl. Brave and Loyal). Photo: LS. The funding of these Coins is taken out of a so-called representational funds. This money can be used for pens, stickers, and t-shirts. Or medals. The sky is the limit in terms of design, and the fact that Challenge Coins are not issued by official institutions, such as the Ministry of Defense, becomes even more obvious in this context. The Coins often feature official emblems. These must be registered at and approved by the Streitkräfteamt (engl. Armed Forces Office). Anything else can be designed at the discretion of the person who wants to order the Coins. Private mints and companies are then commissioned to produce them. Sometimes, German Challenge Coins rely heavily on impressive symbolism. Sometimes they don’t. Sometimes they’re numbered consecutively, sometimes they aren’t. They might depict the outlines of countries of deployment or nifty allusions only insiders will understand. They are struck in gold, silver, brass, nickel, iron, and copper. Emblems, punched holes, rotating elements, and colors. Anything is possible. The aforementioned spokesman of the Ministry of Defense once received a Coin made of Meissen Porcelain. The Medical Corps task force had color applied to this Coin. On the right, it features the emblem of the Verband der Reservisten der Deutschen Bundeswehr e.V. On the left, we can see the Medical Corps logo. The motto “Excellentia Exemplo Est” is depicted below. Photo: R. Wieking. Why should you always have it on hand? Challenge Coins are handed out by those who ordered them in the first place. They’re then distributed amongst the respective unit, training group, division, task force etc. In the meantime, some Coins have also been given out to civilians and diplomats during official tours or military exercises abroad, but unlike in the United States, this has not yet become the norm in Germany. The Coins are always passed in an official handshake. 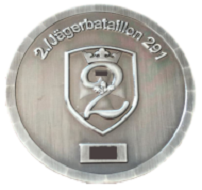 This Challenge Coin was minted on behalf of the 3rd company of the Jägerbatallion 291 to mark the UN MINUSMA mission in Mali. The obverse features the number 3 as well as a combat helmet and oak leaves (the beret flashes of Jäger troops). 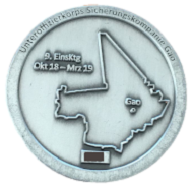 The reverse depicts the outline of Mali, the deployment location Gao, the deployment unit, the time of deployment, a serial number (censored) as well as “Unteroffizerkorps Sicherungskompanie Gao“. Photo: LS. From this moment on, the Coins always have to be within reach, as the infamous “Coin Check”, the reason why these medals are referred to as “Challenge” Coins, can happen anywhere and at any time. It can be called out or merely initiated by quietly raising one’s Coin. All soldiers present in the same room must then show their own Coins. If they’re unable to do so, then they have to buy a round of drinks. In addition, every group can also invent their own rules. They just need to be written down and put up somewhere for everyone to see. A training course of medical officers had this Coin minted in 2017. In a certain light, the coloring on the Coin’s reverse resembles the ocean’s waves. 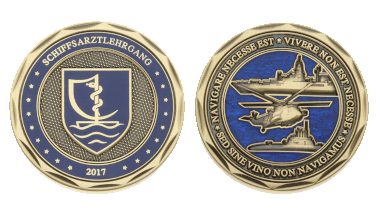 The Coin also features Navy ships, a helicopter, as well as a humorously modified quote of Pompeius. The obverse shows an emblem which is similar to the official Medical Corps one. Photo: DerTaler.de. At the end of the day, this entertaining challenge is only one side of the medal. The other one signifies the immortalization of an important chapter in somebody’s life, of a profound sense of belonging, and of a great success. Maybe that’s also why these Coins remain fairly unknown in Germany and have not yet been spotted in gift shops or at coin conventions as frequently as in the United States. All former and current soldiers I talked to were able to recount emotional stories that their Challenge Coins remind them of. In their eyes, they are symbols of camaraderie. For others, they also represent pride and honor. This private collection of a fleet medical office does not only include German Challenge Coins. Photo: R. Wieking. Of course, Challenge Coins are being collected! However, so far only service members have started to collect them. It’s a fairly unknown field of collection amongst civilian coin enthusiasts. On the one hand, this is probably due to the fact that there isn’t as much information available about Challenge Coins as there is, for example, about orders of chivalry, war medals, or the donativa of Roman emperors. Beyond this, their unofficial nature makes it difficult to determine the limits of this field. Can you ever claim to have completed a collection of Challenge Coins? At the end of the day, these Coins are first and foremost mementos that no price label can be attached to. Hardly any soldier would voluntarily sell their Coins. You have to earn them. 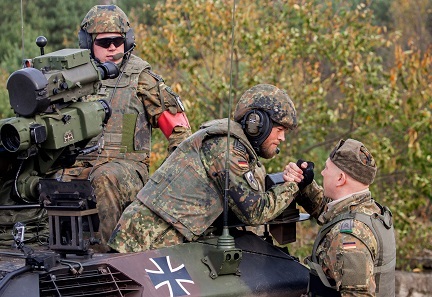 More information on the Bundeswehr is available on the Bundeswehr website (German only) and the Ministry of Defense website. CoinsWeekly has published an interesting article about a Challenge Coin issued on behalf of Donald Trump.